Well done to the 8 students from Trimdon Village who spent the week learning Paediatric First Aid and passed with flying colours. The course is normally run over two days but we were asked to split it over 4 mornings to suit the needs of the group and were happy to help. 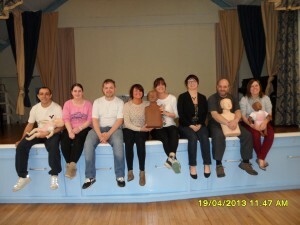 The group were very enthusiastic about learning first aid and made my job easy. The village hall was a great venue for training with loads of space for the practical activities. The Level 2 Paediatric First Aid Course that we deliver is accredited by Highfield (HABC) or Qualsafe Awards, to ensure that you receive a nationally recognised certificate. The course content is to OFSTED and EYFS requirements and it appears on the QCF, so is ideal for those working or intending to work in early years settings such as a nursery, playgroup, afterschool group etc. 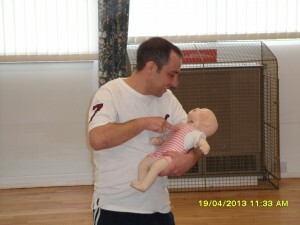 What Will I learn On My Paediatric First Aid Course? On the course you will learn how to deal with accidents, emergencies and medical conditions suffered by children and babies. You will learn CPR for adults, children and babies. How to deal with an unconscious casualty. Treatment of wounds and bleeding. Management of fractures, dislocations and spinal injuries. How to deal with a range of childhood conditions and illnesses. How Can I Book This Course? If you have a group of up to 12 learners, who you would like trained in Paediatric First Aid on your premises, call or email and we will provide you with a highly competitive quote. Don’t forget, if you only have small numbers to train, we are happy for you to join together with other companies to make your course cost effective. Joint MD at T&G Training. Enjoys teaching food safety and first aid to customers throughout the northeast. Hobbies include riding 50s/60s motorbikes and walking (usually when they have broken down). 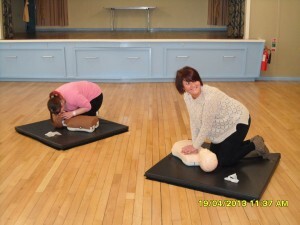 Another 2 successful First Aid courses at the fabulous #700Club charity in #Darlington – well done folks. Well done to our Level 3 #HealthAndSafety students from #BarnardCastle – All passed with distinction – Brilliant! Well done to the 7 after school club staff who successfully passed their Epipen and allergy awareness training. Last weeks Level 4 Health & Safety course was thoroughly enjoyed by both tutor and students. Give us a call to book your staff onto this challenging and important course – 01913000232. Congratulations to Gail on gaining her Assessing and Internal Quality Assurance (IQA) Certificate! The law regarding sales of packaged and pre-packaged food has changed. Food Information for Consumers Regulation (EU) No. 1169/2011 requires that you provide accurate information to your customers about the content of your food with regard to allergens – Call us for advice and guidance – 01913000232.